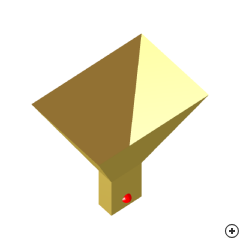 The horn antenna is one of the simplest and probably the most widely used microwave antenna. Its existence and early use dates back to the late 1800s, and is widely used as a feed element for large radio astronomy, satellite tracking, and communication dishes found installed throughout the world. It is a common element of phased arrays and serves as a universal standard for calibration and gain measurements of other high-gain antennas. As such, it is often referred to as the standard gain horn. The most widely used horn is one which is flared in both directions. It is widely referred to as a pyramidal horn, and its radiation characteristics are essentially a combination of the E- and H-plane sectoral horns.